Mr. Pitta has concentrated his practice for 30 years in traditional labor and management relations in both the private and public sectors, where he represents clients in the hotel, restaurant, sports, entertainment, health care, securities, trucking, construction, real estate, facilities management, cleaning and maintenance, moving and storage, airline parts manufacturing, sanitation, law enforcement, fire safety, education and higher education industries and professions. Mr. Pitta is also the founding and managing partner of Pitta Bishop & Del Giorno LLC, a consulting, lobbying and government relations firm. 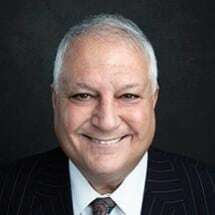 Mr. Pitta practiced with Shea & Gould from 1980 to 1994, and he was a partner and chairman of the firm’s labor practice group and co-chairman of its government relations practice group from 1989 to 1994. After the dissolution of Shea & Gould, Mr. Pitta was a partner of Richards & O’Neill LLP from 1994 to 1998 (the firm merged into what is now Bingham McCutcheon LLP). He was a partner of Herrick, Feinstein LLP from 1998 to 2003; Pryor Cashman Sherman & Flynn LLP from 2004 to 2006; and Pitta & Dreier LLP from 2006 to 2008. He is a member of the Bar of the State of New York and is admitted to practice before the U.S. District Court for the Southern and Eastern Districts of New York and the Supreme Court of the United States. Mr. Pitta received a Bachelor of Arts from St. Francis College in 1972 and a Juris Doctor from Brooklyn Law School in 1978. Mr. Pitta is active in and a board member of numerous charitable, civic and professional organizations. He currently serves on the boards of trustees for Daytop Village Foundation, Inc., the Richmond University Medical Center and the Catholic Legal Immigration Network, Inc. Boards of Trustees of Daytop Village Foundation, Inc. Boards of Trustees of the Catholic Legal Immigration Network, Inc.